When I found out that Escape For Men has been discontinued, a triumphant smile appeared on my face. Sadly, that's now faded, because CK have played around with the formula and are about to inflict it on us all over again... except this time it's called Eternity Aqua. A textbook example of redundancy, this characterless flanker throws in the predictable stock of 'fresh' materials (think: the aquatic-melon quality of helional + the aquatic-ozonic feel of calone) and laces it with a hint of the lavender that made the original Eternity memorable. As a name, 'Aqua' is spot-on: this is washed-out perfumery in full, market-driven, cynical glory. Sure, a good deal of competence has gone into putting the ingredients together, but with the aim of doing nothing more than cloaking you in blandness. As far as I can see, only one aspect of this release is noteworthy: the advertising poster. Or, to be more specific, the thin kitten whiskers that are meant to represent chest hair in the advertising poster. For years, CK have pushed the borderline-fascist image of young men with androgynous faces and depilated physiques. Now they're aiming for a look which, by their standards, is 'coal-miner rugged', but their attempt is as awkward as the juice it's trying to sell. 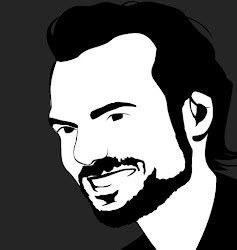 Excellent article, you hit the nail on the head. Yet another bland, faceless, mainstream release that doubtless will sell like hot cakes. Michael, thanks very much indeed for taking the time to write. 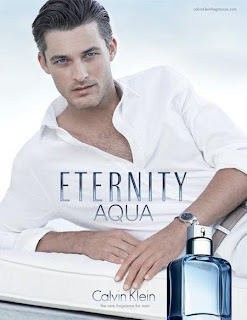 As a teenager, I always had a lot of time for the original Eternity and I still think it smells pretty good for what it is, but all these new flankers are just depressing.